One of my most exciting areas within my innovation activities is applying the three horizon methodology, for working through the ‘appropriate’ lenses for different innovations and their future management. Let me outline the rationale for adopting this within your organization. For me, the three horizons have great value to map different thinking and possible innovation options over changing horizons. You can frame innovation in alternative ways by using this approach. Innovation has multiple evolution points and working with this framework allows you to significantly improve innovations contribution. It goes well beyond the present value of ‘just’ fitting your existing innovation portfolio and directional management into a one dimensional, viewed in the present, framework. You can see opportunities completely differently beyond the existing mindset and activities, it takes innovation from tactical to strategic, to foresight in your evaluations. Innovation is constantly facing disruption; it is constantly going through life cycles and new waves of different activities. We need a far more robust, well thought-through way to apply our innovation resources to meet and anticipate these changing events. I’ve outlined the three horizon methodology I subscribe too, in a number of different blogs and these can be viewed here, here and some further thoughts here. They each contribute into your understanding of this emerging frame so I’d ask you to spend a few minutes viewing these if you feel this has real value to you and how you need to manage your innovation in better ways. We are all well aware that organizations struggle on innovation – they seem to have real difficulties to climb out of the incremental traps. One of the primary reasons is that they fail to apply different mindsets to evolutionary thinking and stay locked in the ‘here and now’ and this is such a huge mistake. I believe the three horizons can be specifically set up for a specific innovation engagement to allow you to have some far more stimulating and added value to your discussions around innovation, these can go from detailed to broad evolutionary explorations and so, radically alter many of your present constraints and debates. We need to separate and structure different mindsets to developing innovation capabilities. Structuring the approach, by looking across multiple horizons, allow you to evolve the entire innovation portfolio and begin to recognize the many gaps that exist within your thinking, within your capabilities and capacities to innovate. By looking at this through separate lenses assists you in allocating the appropriate but usually different resource needed to be applied to each of the time horizons and challenges that lie within. There is this prevailing or dominant system where many organizations stay firmly engaged within, that needs radically challenging, as this is the famous incremental trap where growth performance stays restricted . The three horizons ‘asks you’ to apply three totally different mindsets to see constraints, weaknesses and often very limited opportunities differently, it alters your thinking into a far more evolutionary approach. The (big) idea is you go beyond the usual focus on fixing problems in the present and begin to plot and map some of the future disruptions that might occur as you move forward. You work and think through three different time and clarity lenses focusing on different horizons. The three horizons also seeks to capture the linkage on the transition points and possible disrupting junctions, as well as highlights those potential gaps presently seen that needs clearly resolving. It can provide the ‘distinction of choices’ as well as begins to highlight present organization realities. The more you ‘see’ the more you can fill those gaps. The more you can foresee, the more you can become ready for managing transformation that will be needed. The three horizons will also help you on innovation differently than the S-Curve approach, as it is more evolutionary where you are work far more concurrently and building capacity and understanding progressively on the future “predictions” as they emerge and become clearer. a) Firstly clarify the burning needs relating to your present position and required future position by asking what improves existing activities, what extends the current competencies and takes you into new avenues to develop/ mature. Link it to your known strategy but keep questioning this to keep it fresh and relevant to ever-changing market conditions. b) Then by deciding and weighting accordingly the winning needs you begin to articulate and frame these. These concept storyboards provide the necessary linkage; it captures emerging trends for constructing plausible and coherent innovation activities projected into the future. These begin to shape the decisions on resources and to determine investment options. This offers a clear shaping of the search for emerging winners yet you are still able to constantly scan the horizons for changes. c) By looking across the three horizons separately you allow H2 to have the discussions for the “space for transition” and resolve the constant dilemma of “protecting core or investing in new” debates. d) The H3 starts exploring fundamental different premises for replacing “business as usual” with exploring nascent ideas, concepts that might replace what you presently have, it begins to shape your thinking and awareness of what is needed to build capabilities and capacities. e) Often these H3, even some in H2 are weak signals today where many unknowns prevail but allow you to straddle between (h1) improve, (h2) extend and (h3) change. Planning in different horizons needs different tools and these are based on (h1) see and operate, (h2) adjust your thinking frame and solutions, (h3) more evolutionary. Each has different techniques to explore. For me innovation portfolio allocations require the double axis of knowledge needed, over the axis of known knowledge, to manage the dimensions of innovation concern, to see and operate accordingly. This is something I’ll explore at another time. Different mindsets and discussions are based on (h1) operational: the here and now, (h2) more entrepreneurial: attempting to detect shifts and adjusting in agile ways, (h3) more futuristic: based on values, visions and beliefs. Each needs separating. There is a need to work through “typical” dangers – competing voices, mixed signals and all the uncertainly dimensions. What you must consciously stop doing is looking backwards (legacy) and keep the mind ‘free’ to project forward. There is a lot of work specifically on the mindset traps and how to avoid them, or to find the solutions, to surface them and address them. Work through the visualisation and turning the “talking into planning” you can work through three options (h1) what’s now, (h2) what’s next and (h3) what’s the goal to drive towards in descriptors and actions (resource allocations and specialised need to develop for example). This helps further extend your horizon thinking and relate this into the actions you need to take. The three horizons for innovation is very useful. In the words of Mahatma Gandhi ““First they ignore you, then they laugh at you, then they fight you, then you win”. The three horizons does allow you to pick your fights and show others how and where you can possibly win in better ways than just in the ‘present’. Can you see the three horizons value? 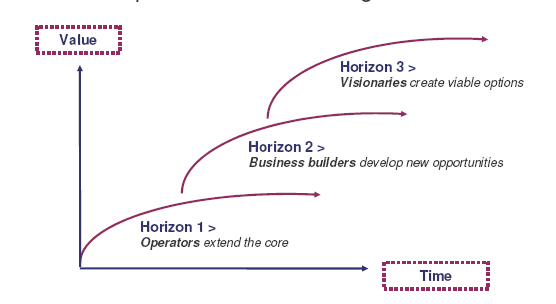 The value of the three horizon approach for innovation is where I partly wish to take my work beyond its present position through far more testing and exploring its application across different challenges and business segments. I’m looking to engage with organizations on this – do you want to make a proposal? I’d welcome the opening conversations on this with you. This entry was posted in Sequencing and tagged capabilities for innovation, innovation pipeline management, innovation portfolio management, Mapping your resources for innovation, planning innovation execution, three capability building platforms, three horizon approach, three horizon framework, three horizons, Three horizons for innovation. Bookmark the permalink.